As you guys might have heard, I’m one of the 2015 Dole Get Up and Grow Ambassadors joining an amazing team of bloggers like Eating Bird Food, Rabbit Food for My Bunny Teeth, The Jolly Tomato, Farmgirl Gourmet, My Life As a Mrs., Healthy Happy Life and more! It’s a serious dream team and I’m so honoured to be a part of it. My fellow ambassadors have been sharing a ton of healthy, tasty Dole recipes so far this year so be sure to go check out their sites too! Dole Get Up and Grow! is all about promoting simple, healthy, plant-based eating and getting active! Isn’t that awesome? In the spirit of staying healthy and active this summer, what better time for an ode to Dole bananas! Bananas are truly nature’s most convenient source of natural energy! You can’t beat them for a quick, healthy snack whenever you need a boost. They’re inexpensive, vitamin-rich, portable, versatile and delicious! 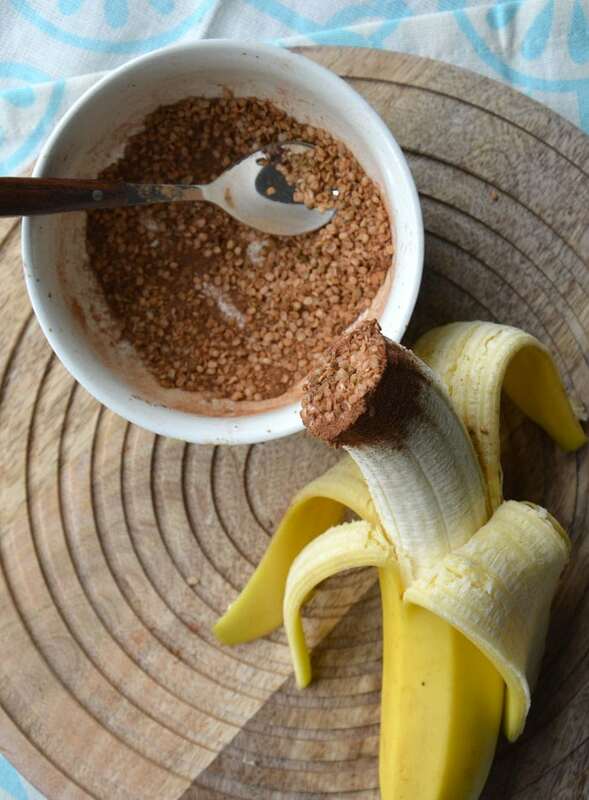 I eat a banana every day, usually straight from the peel for pre-workout fuel but I also love to use them for quick and easy snacks and desserts! You can get away with eating a small healthy dessert daily if you stick to whole foods, avoid refined sugars and keep your portion sizes in check. In comes banana. Naturally sweet and the perfect base or yummy topping to so many different desserts and fun snacks! Aside from toast with peanut butter and slice banana, these are some of my favourite, easy, vegan banana snacks and desserts. Enjoy! Mix and match to come up with your favourite dipping combos! This simple dessert is super easy and delicious enough to satisfy your sweet tooth! Simply mix a little cocoa powder with liquid stevia and coconut oil in a small bowl and then slice in a banana. If you’re feelin’ really crazy, crumble a chocolate chip cookie on top or add some homemade granola! You can use maple syrup instead of stevia if you prefer and almond milk or even water works to replace coconut oil if you need to reduce the fat. This is so simple and so yummy. Just slice a banana lengthwise and then into pieces, sprinkle with cinnamon and coconut palm sugar and microwave for about 60 seconds. It’s unreal. This makes a great topping for other desserts or even stirred into oatmeal for a burst of banana flavour. You can skip the added sugar if you’re watching the amount of sugar in your diet, the cinnamon by itself is wonderful too! This is as easy as can be. Take a whole wheat tortilla, spread some almond or peanut butter in it, peel a banana, stick it in there, roll it up and eat like a wrap! Some fun add-ins are shredded coconut, cocoa powder, raisins, chopped dates, hemp seeds, ground flax seeds or chia seeds – get creative and have some fun with it! You can also slice it up to make little banana sushi bites. You can also make awesome graham cracker banana sandwiches with peanut butter, sliced banana and chocolate sauce for a delicious, s’more-inspired banana dessert! There are plenty of ways to make frozen banana snack bites. 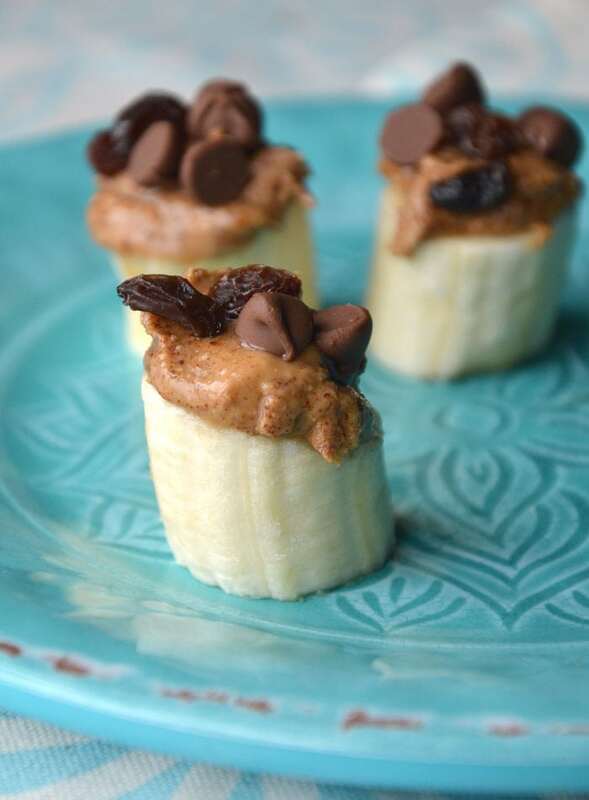 My favourite is to slice a banana into approximately 1/2 inch pieces, place a little dollop of peanut butter on each piece then dunk each piece into melted dairy-free chocolate chips and place on a wax-paper covered pan. Stick the pan into the freezer until the chocolate has hardened then enjoy! Pictured above is a simple chocolate-dipped version sprinkled with unsweetened shredded coconut. So easy and so delicious!! 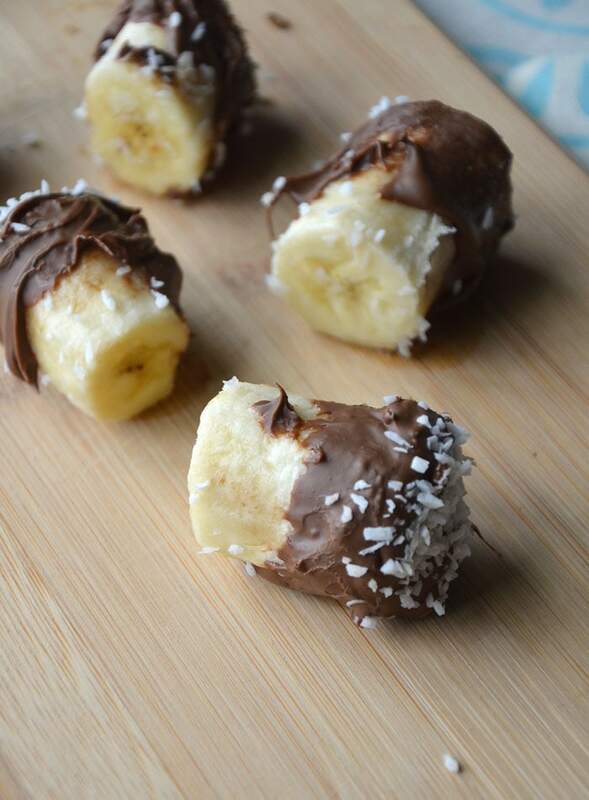 You can also make these as frozen banana pops. 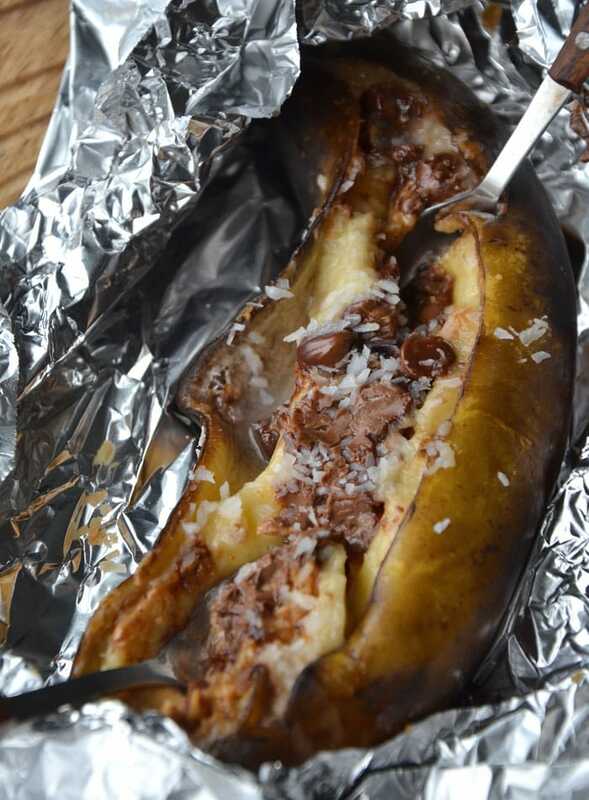 Just cut a banana in half, stick a popsicle stick in it, roll it in melted chocolate and then a topping like chopped peanuts or walnuts place on a wax paper-covered pan and let set in the freezer. This another favourite of mine for a simple and tasty dessert. Slice a banana into one inch pieces and place on a plate. Top each piece with a dollop of almond butter, a raisin or two and a few dairy-free chocolate chips. To take this next level, add a few pieces of coconut bacon to each crown! Serious yum. Banana and coconut are a match made in banana heaven. To elevate a bowl of sliced bananas, place a can of coconut milk the in the fridge overnight. In the morning, open it up and scoop the thick cream off the top and into a bowl. Using a fork, whip the cream vigorously until it’s nice and fluffy then fold in a little maple syrup to sweeten it. That’s your coconut whipped cream! Next, spread some unsweetened shredded coconut on a pan and stick it in the oven on 350 degrees for 5-10 minutes until it starts to turn golden brown. Top a bowl of sliced banana with a big dollop of the coconut whip cream and then sprinkle the toasted coconut on top. It is out of this world good! To take it even further…you know what’s coming….add chocolate, obviously. Melted dark chocolate or dairy-free chocolate chips, chopped dark chocolate or a drizzle of chocolate sauce are all awesome additions. For a super yummy little chocolate banana pudding, just mash a banana up in a bowl and add cocoa powder and sweetener of choice! You can also make it in a food processor or blender if you want it a little smoother. Depending on how ripe your banana is, add a little coconut or almond milk to smooth it out a bit. You can heat this in the microwave too to make it all ooey and gooey and caramelized. It’s so good! We used to make these on the BBQ when I was a kid, they’re such a classic and decadent dessert! Who’s had these before?? They are amazing, aren’t they? Simply pre-heat the oven to 350 degrees, take a banana and leaving the peel on, slice it lengthwise creating a pocket where you can stuff in your fillings. Now the fun part! Add all your toppings! Dairy-free chocolate chips or dark chocolate is a must, peanut butter is a favourite of course, the rest is up to you! A drizzle of maple syrup is delicious, a sprinkling of cinnamon or maybe a little coconut or crumbled graham crackers? Vegan marshmallows would be awesome if you can find them! 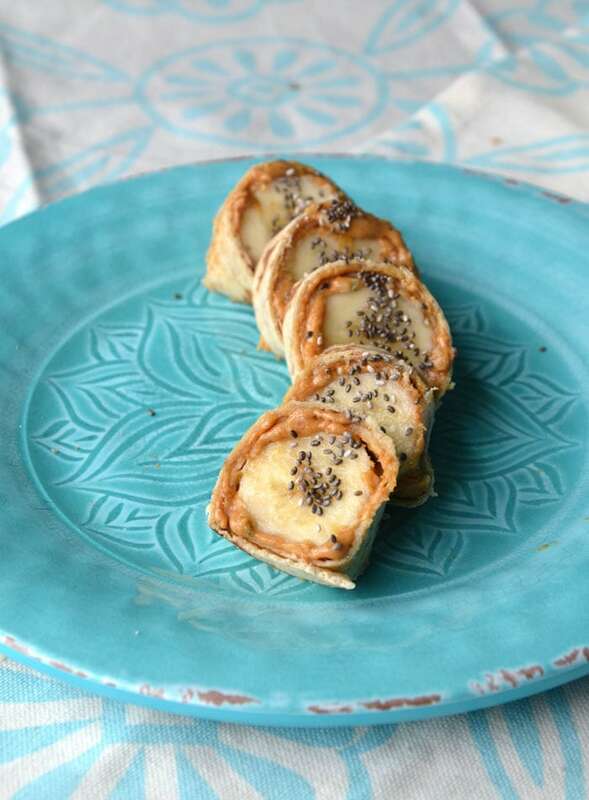 Once you’ve added your favourite fillings, wrap up the tin foil and bake for approximately 15 minutes. When they’re ready, carefully pop open the tin foil and dig in! You can also bake these on the campfire making them a perfect dish-free camping dessert! These are very decadent for something so simple. You can eat them on their own for an incredible dessert, or use them as a topping for ice cream, pie, sunday morning pancakes or whatever else you can come with! To make them, heat a little coconut oil or vegan margarine in a pan and then add sliced banana and 1-2 tbsp of coconut sugar, brown sugar or maple syrup. A little cinnamon is a great addition too! I’ve even made them in a pan with just sugar and no oil, just be careful not to burn them. When they’re sticky, caramelized and smell amazing, dig in! If you missed my post on the Dole Get up and Grow! Tour, check that out here to see if they’re coming to a city near you! 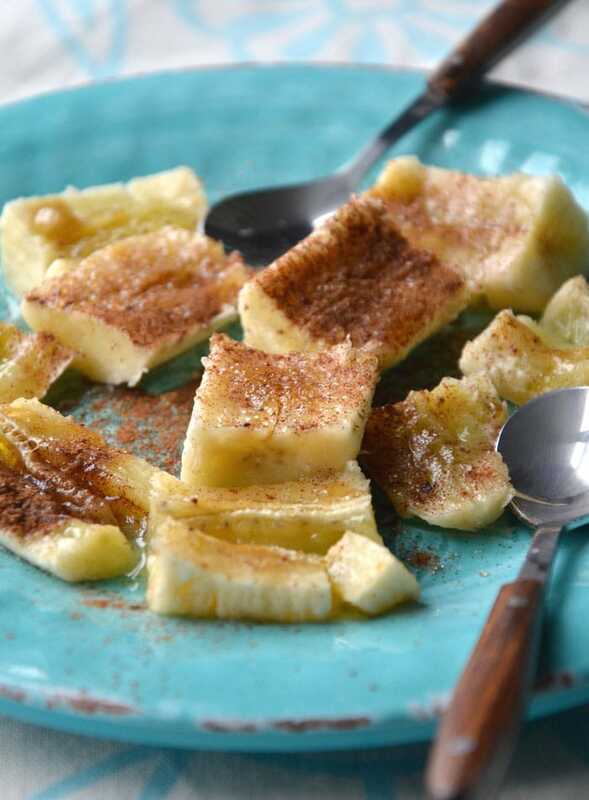 I’ll be sharing more Dole recipes later this year, for now, enjoy fuelling your summer adventures with healthy and delicious, easy banana snacks and desserts! So, what’s your favourite no-recipe required banana snack or dessert? Let’s hear it! !